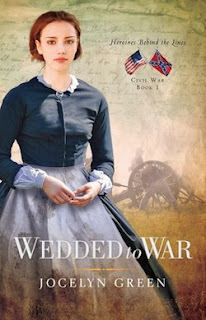 Today CFBA introduces Wedded to War by Jocelyn Green. Hallelujah that the days of 18-inch waists and 6-foot hoop skirts have passed us by! Another hooray that both our living and medical practices have changed, in terms of cleanliness! Despite some gory descriptions (ie: flies and maggots crawling in and out of open wounds) and the unpleasant subject of prostitution that many immigrant women unfortunately surrendered to, Jocelyn wrote a compelling novel of a grim time in our nation's history. Jocelyn's descriptions were vivid, and I felt I could see, hear, and smell all of the horrors of a Civil War hospital or depravity of a NYC slum. 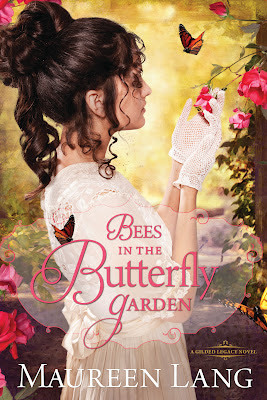 And yet, Jocelyn also managed to weave in a sweet love story amid the pain. She made me want to read more! Widow of Gettysburg, Yankee of Atlanta, and Spy of Richmond are listed as future offerings (April 2012-January 2015) of the Heroines Behind the Lines series! When Charlotte and Alice told their mother they were taking the omnibus down Broadway, they weren’t lying. They just didn’t tell her where they would be getting off. There was simply no time for an argument today. Boarding at Fourteenth Street, the sisters paid the extra fare for their hoop skirts, as if they were separate passengers, and sat back on the long wooden bench for the ride. “This is against my better judgment, you know.” Alice’s voice was barely audible above the clatter of wheels and hoof beats over the cobblestones. “Don’t you mean Jacob’s?” Charlotte cast a sidelong glance at her sister. Alice twirled a ringlet of her honey-blonde hair around her finger —a nervous childhood habit she never outgrew—but said nothing. She didn’t have to. Ever since she had married the wealthy businessman a few months ago, she had been even more pampered—and sheltered—than she had been growing up. Heaven help her when they reached their destination. “Why do I have the feeling it isn’t a good one?” Alice planted her palms on the bench beside her again, bracing herself against the jarring ride. Alice’s eyes narrowed, but she let it rest as the omnibus slowed to a halt and more passengers squeezed beside the sisters. Any further conversation would soon be drowned out by the cacophony of Broadway. The avenue throbbed with life, like an artery coursing down the island of Manhattan. Ten days into the war, recruiting offices for the Union army had already cropped up along the avenue, their entrances clogged with eager young men. Between Canal Street and Houston, the street teemed with gentlemen in spats and ladies in silks, their musk colognes and lavender perfumes cloying on the warm breeze. The white marble façade of St. Nicholas Hotel between Broome and Spring Streets dominated the west side of Broadway. In front of The Marble Palace facing Canal Street, porters in their brass-buttoned, blue uniforms opened carriage doors and escorted their elite customers inside, where they would no doubt spend staggering sums on the latest Parisian fashions. But Charlotte and Alice did not get off at any of these places. At least not today. For just a few blocks south of The Marble House, and just a few blocks east of the German-Jewish secondhand clothing shops on lower Broadway, the steady pulse of polished society gave way to the erratic beat of Five Points, the world’s most notorious slum. Alice squeezed her sister’s hand so tightly Charlotte couldn’t tell if it was motivated by anxiety or anger for bringing her here. If Broadway was Manhattan’s artery, Five Points was its abscess: swollen with people, infected with pestilence, inflamed with vice and crime. Groggeries, brothels, and dance halls put private sin on public display. Although the neighborhood seemed fairly self-contained, more fortunate New Yorkers were terrified of Five Points erupting, spreading its contagion to the rest of them. This was where the Waverly sisters got off. Competing emotions of fear and excitement tugged at Charlotte’s heart as she hoisted the skirt of her amber-colored day dress above her ankles and began heading toward Worth Street. “Come on, Alice,” she whispered, cocking her head at her dumbstruck sister. A foul-smelling breeze teased strands of hair from their coifs, crept into their noses, and coated their throats. Charlotte had forgotten how the smell of poverty would stick to her skin. Swallowing her distaste, she vowed to scrub herself with sugar and lemon-infused olive oil as soon as she returned home. Pressing a violet-scented handkerchief to her nose, Alice held her parasol low over her head, blocking out as much of the view as possible as she began walking. “Where are we going?” Her words were muffled, but her discomfort was not. With her parasol in one hand and a fistful of skirts in the other, Charlotte set a brisk pace. As they turned onto Worth Street’s littered sidewalk, Alice skirted a child leaning against a lamppost, hawking apples from a broken crate. Charlotte stopped short. “Of course!” Charlotte reached into her dress pocket and traded several coins for two small, bruised apples smelling of fermentation. “Charlotte!” Alice gasped while Maggie’s dirty face brightened. It was far too much money to spend on apples—especially rotting ones. With “Bless you Miss!” ringing in her ears, Charlotte joined Alice with both apples in one hand, skirt now dragging on the sidewalk. “Can we hustle, please?” Alice’s voice was still muted behind her handkerchief. Charlotte was eager to comply. Virtually every tipsy wooden building on this block—including Crown’s Grocery—housed a brothel, and none of them bothered hiding the fact. Bareheaded and bare-chested women stood in doorways quoting their rates to passersby, even in broad daylight—which was a dirty yellow, like a fevered complexion. By the time they stepped into the slanted shadow of the six-story House of Industry, Charlotte noticed she had been holding her breath. The vapors in this area could truly make one sick. “Forgive me, this is my younger sister Alice—Mrs. Jacob Carlisle.” Charlotte and Alice entered the building ahead of Mr. Pease, who closed the door behind them. “She’s in town visiting for a spell while her husband is away on business.” She set the apples down on the hall stand and wiped her gloves on her skirt. Pease bowed slightly. “A pleasure to meet you, madam. Mr. Dorsheimer is already here,” he added in a whisper just as the visitor’s barrel chest entered the room ahead of him. “Ah, Mr. Treasurer. Allow me to make the introductions. Miss Waverly, Mrs. Carlisle, this is Mr. Phillip Dorsheimer, Treasurer of the State of New York and the New York State Military Board. He’s here all the way from Buffalo, and we’re so fortunate he’s making time to meet with us.” Mr. Dorsheimer ignored Charlotte’s outstretched hand, fading both her smile and her confidence. Without even the slightest acknowledgment, Mr. Dorsheimer frowned at his pocket watch. “Can we get on with it?” His jowls quivered as he spoke. Charlotte took a deep breath and squeezed her parasol handle. So far, this was not going as she had hoped it would. Mr. Dorsheimer tossed cursory glances into a few of the workshops. If Mr. Dorsheimer felt anything, he hid it well in those doughy folds of skin. The palms of Charlotte’s gloves began to dampen with sweat. Mr. Dorsheimer, winded from the exertion of the climb, did not look impressed. “These rooms are humble enough, indeed,” Charlotte added, “but when you consider many of these people are used to sleeping on the bare floor of a room with no windows and laid out like sardines in a can, you can understand the charm of a bed and some—air, can’t you?” Calling it “fresh air” would have been a lie. With human waste collecting in trenches behind most Five Points tenements, no air had been fresh here for decades. At least windows allowed circulation. Thank you to Jocelyn and River North through CFBA for sending me a copy to read and review! I finally received Chameleon by Jillian Kent and have added my review HERE. Our garden is doing so much better than I'd expected, despite the lack of rain! My cucumbers had the roughest start -- with 2 replantings and only 1 final plant surviving. 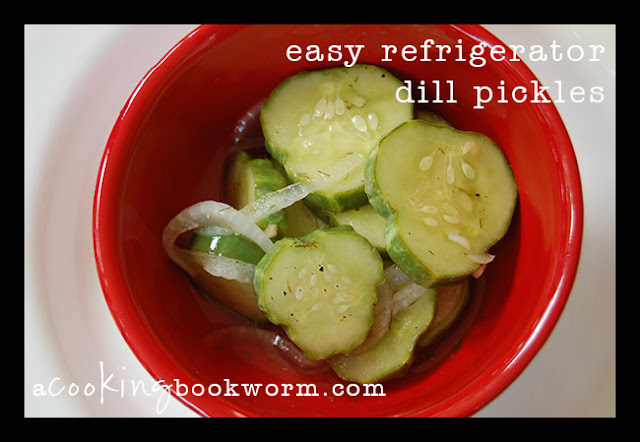 So, I'm not sure I'll get enough cukes to can jars and jars of pickles, as I dreamed...but, these refrigerator dills are bringing family satisfaction! This recipe came as a result of combining a few recipes I found online...and needing to substitute a few spices because I haven't bought my pickling spices yet. Mmm... they are delicious and crisp! Be sure to let them sit for at least 24 hours before tasting! Add 3/4 cup hot tap water and stir until sugar and salt is dissolved. Now, thinly slice 2-3 large cucumbers and place in brine. Put in fridge and let sit for 24 hours (you can stir a few times to make sure all cukes get a chance to marinate). Pickles will keep for up to a week (but they won't, because you'll eat them)!